When you hang a Dresden Star Ornament on your tree this Christmas you are guaranteed to have a one-of-a-kind, handmade work of art. Dresden Star Ornaments are lovingly hand-crafted from beautiful antique chromolithographs (called "scraps"), old glass ornaments, and a variety of vintage Christmas decorations, making them truly look like antique Christmas ornaments. Dresden Star Ornaments was born out of our love for the original and scarce antique Victorian ornaments we have always admired. Unfortunately we found that many original elaborate and fantastic ornaments were hard to find. Often they were either in poor condition (broken, and/or missing parts), or in someone's personal collection, only available for viewing in book or museums. We had been collecting bits and pieces of old Christmas tree decorations, vintage glass ornaments, and century-old diecut papers. Suddenly it occurred to us that we could make our own Victorian Christmas ornaments to hang on our feather trees. 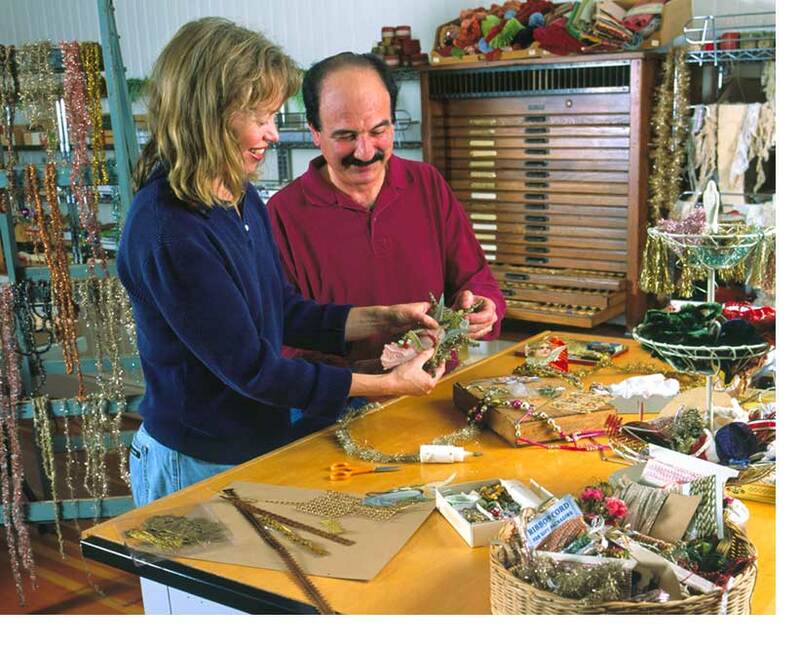 Making ornaments was so rewarding and fun that it became a home-based business. Each ornament is hand-signed either by Gail or Glenn Giaimo; we are the only artists making the ornaments, thus giving us the control to ensure the very best quality and craftmanship. 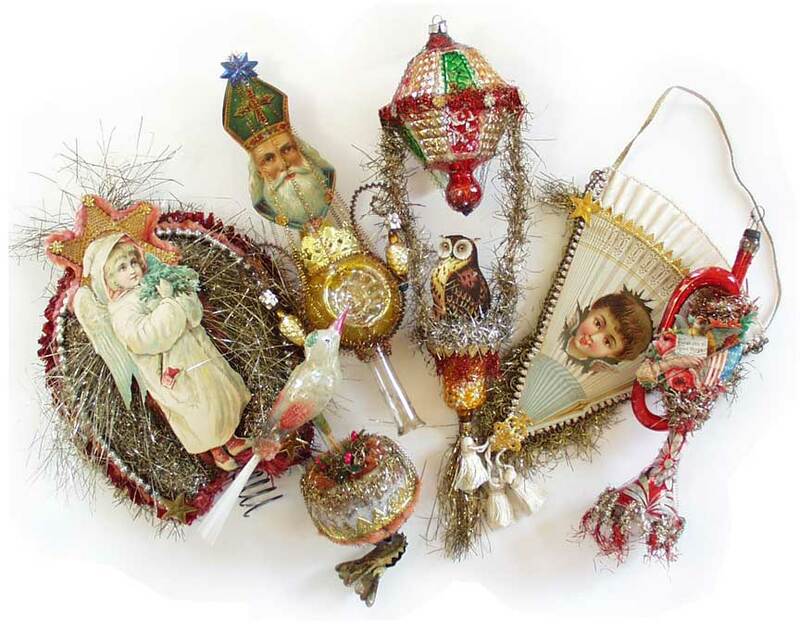 The one-of-a-kind materials we use to create our ornaments make them rare treasures indeed! Our spacious workshop is brimming with our growing collection of wonderful antique and vintage ornaments, lace, papers, and sparkling tinsel. With an attitude that seriously goes beyond up-cycling, we breathe life into these beautiful old materials by creating amazing works of art you can hang on your tree. Dresden Star Ornaments are not intended to be reproductions of antique ornaments. The imaginative way we use our materials makes our ornaments very inventive and elaborate. Vintage and antique materials are incorporated into each ornament, so a Dresden Star Ornament feels like an authentic, old ornament, but with more personality and attention to detail. In the original ornament, pictured above left, note that the glass "boat", while discolored, is still intact. The crinkle-wire around the ornament is damaged, as is often the case. An antique Victorian ornament like this one, even in this condition, could be quite expensive. 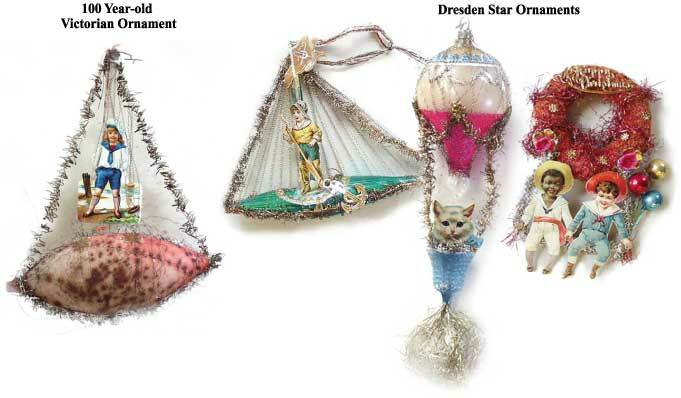 Dresden Star Ornaments, pictured above right, are constructed from early vintage and antique materials. All of the colorful die-cut scraps are century-old Victorian chromolithographs. The glass ornaments used to create the Christmas ship and hot air balloon are 80 to 100 years old. Scraps, antique Dresden papers and old rope tinsel were carefully reinforced and held in place with durable acid-free glue. We added high-quality crinkle-wire to ensure the ornaments will last for generations to come. Dresden Star Ornaments are more vibrant, fanciful and elaborate than the original decorations that inspire them! SEE MORE ABOUT OUR ORNAMENTS. We never run out of new ways to express ourselves through our art. As a husband and wife team, we love to share our ideas, and come up with new, inventive ways to create and market our ornaments. We would love the opportunity to make an ornament just for you and can work within your budget and preferences. Our customers inspire us to do our most creative work when they request custom orders. LEARN MORE ABOUT CUSTOM ORDERS. March New Arrivals Featured on Youtube!